The official blog of KlezKamp: The Yiddish Folk Arts Program, taking place annually in December at the Hudson Valley Resort & Spa in Kerhonkson, New York. Sponsored by Living Traditions. It is with great joy and excitement that we announce the 29th edition of our beloved KlezKamp, this year dedicated to the future of our culture with a past! Di Naye Khvalye (The Yiddish New Wave). This theme allows us to celebrate the forward thinking legacy of those who saw Yiddish as the future of Yiddish and the new generation who understand that embracing our Yiddish past gives us all a soild foundation for the future. As our new brochure and website are now hot off the press we invite you to join us to enjoy this ingathering of both veteran and new KlezKamp presenters. It is, as always, a once in a lifetime event. New this year is our reachout to the real future of our culture -- those whom we are calling the KlezMillenials (born after 1983) -- who have taken up their task of carrying our culture into the future. 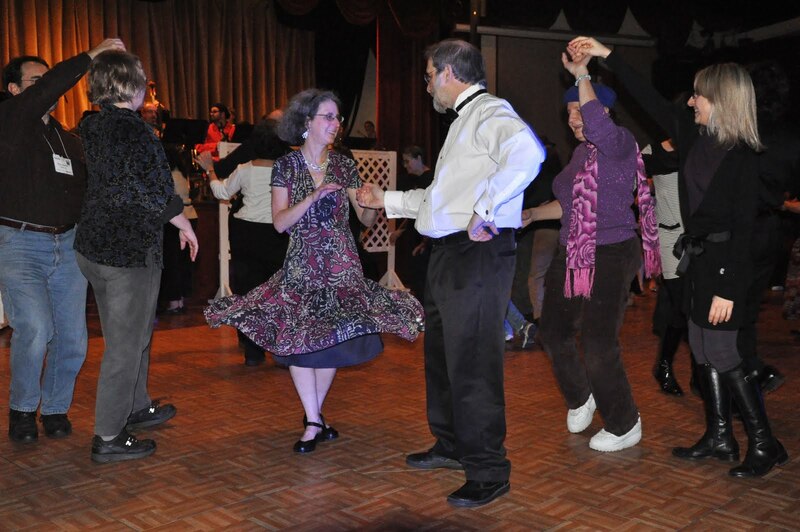 To honor their dedication and spirit we are offering all of them a special KlezKamp registration fee of only $600 which includes room (triple occupancy) board and all classes. This unprecedented offer is in keeping with our dedication to supplying the young generation the means with which to be literate and dynamic carriers of Yiddish in a world where cultural identity and skills have never been more important. Please tell your friends, children, your nieces, nephews, grandchildren and neighbor's grandchildren about this fabulous offer and please join us as we once again make a place for all: young, old, Jews, Gentiles religious and secular to be part of one of the world's great cultural undertakings. As we get closer to the event you will be hearing from me -- and other dedicated Yiddish culture workers in the extended KlezKamp family -- in this blog about our upcoming event. Do not delay. 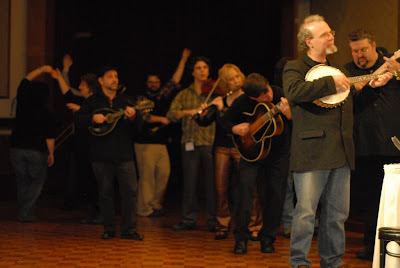 KlezKamp has historically been the hightlight of som many of our attendees year. What a great week. And I can't wait until Summer Kamp in Madison, WI. What does Madison have that Kerhonksen doesn't? Frozen Custard! As I was sadly saying goodbye to the klezkamp community, Joanne Borts shared with me the handout she used in her class, "Better With A Band". In this glossary, she gives non-musicians terms for basic "musician speak". She provides terms like, Major and Minor keys, Coda, Bridge, Tempo as well as Jewish music terms like Doina, Hora, Serba and even the mode names like Freygish, Mishebeyrakh and Mogon Ovos. What a great idea! As those of us who make our livelihood on the bandstand, an educated singer and dance leader makes our job easier. "Don't hook up with the drummer....it can turn out badly...."
Follow this link to see quite a few more pictures of this years fun! Tonight, KlezKamp's newest old tradition Di HooHA our fency-shmency dress up dance party takes off at 7:45 with Tantz Meister Steve Weintraub leading hundreds of dancers in a gaggle of high end ballroom dances. The 20 piece orchestra under the batons of Cookie Segelstein and Pete Sokolow will lay down compelling dance rhythms while dressed as well as if they were actually getting paid for the gig. Add to that the intermission performance of Jenny Romaine's and Tine Kindermann's Youth Theater Workshop production of Di Balade fun dem Yid Vos Iz Gegansen frun Groy Biz Blo (The Jew Who Went from Gray to Blue) after Itzik Manger. Tired yet? How about three (count 'em three) dance bands followed by a midnight Yiddish song kabaret and you have the end of another perfect KlezKamp day. For the last 90 minutes, there have been a two young co-eds, maybe 18-19 at most and cute like heck, flirting furiously entirely in Yiddish. When's the last time you heard that? BTW: all the cool kids speak Yiddish. Man, it was kind of like a dream. 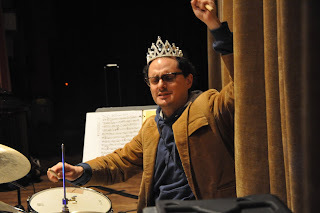 Clarinetist and producer Alex Kontorovich made the treacherous drive up from the city to lead a good chunk of the Klezkamp staff in a tribute concert (turned dance party) to the late clarinetist German Goldenshteyn. The occasion was the release of the latest Living Traditions CD "The Tradition Lives: Yiddish-Moldavian Music of German Goldenshteyn" by the Goldenshteyn Memorial Orchestra. Recorded at Klezkamp just last year, the release sees the reunion of all the players from German's first and only recording "German Goldenshteyn: A Living Tradition," (available on iTunes and CD Baby) playing material chosen by German and Alex for his second release, but sadly was unable to record after his untimely demise not long after the release of his first CD. Links to purchase this CD, as well as the new Pete Sokolow CD, will be posted soon! Last night's staff concert was tremendous, starting with a wonderful short film by Jenny Romaine and ending with a (literally) show stopping turn by Michael Wex and co. with a real great diversity of talent in between. Tonight we have a record release dance party as a roll out for the new German Goldenshteyn Memorial CD recorded at last year's KlezKamp and then, of course, followed by a bevy of our dance bands: ear, reading and Hasidic. Okay, I'm exhausted already. But a good exhausted. Damn, what's all this white stuff?? Well, it's hard to even find time to sit down and write at all. And the first few days were filled with such bad weather and screwed up schedules, we were never sure who was going to get up here and when. Even now a few weary stragglers are stumbling into the resort to find a the toast warm folks inside already deep into yet another deep KLEZKAMP experience. Thanks to what we can only assume was the recent article in the NY Times, there's quite a few new faces, almost as many as folks we already know and that's mighty invigorating. The first nights fun was watching the documentary "A Jumping Night in the Garden of Eden" with it's director in attendance. It was amazing to see all our heroes live in person (Dave Tarras, Leon Schwartz) and many of our staff (Henry, Frank, Lauren, and others) in their youth. The intervening 25 years were presented in sharp contrast to the current state of Yiddish Cultural affairs. Tonight is the staff concert where I'm pretty sure I will be playing a few tunes with Elaine and Susan Hoffman-Watts and the Youngers of Zion w/ Cookie and Hank which is always a selfish highlight for me. Sunday morning at the Hudson Valley Resort and Spa. The skeleton crew showed up last night and we're getting KlezKamp on its feet. It's the calm before the storm: literally. Weather predictions are anything from snow showers to blizzards today. 40 years in the desert did little to prepare us for this kind of weather. "Henry’s residency and the KlezKamp Roadshow generated tremendous excitement for the work that those of you involved with KlezKamp have been doing for the last 25 years. It seemed that there was an audience waiting to happen in Madison, not just in the university milieu, but more importantly, in the communities beyond the university walls. The momentum provided by that residency led to more conversations with Sherry, Carol, Henry and my colleagues at UW about how we might form a permanent partnership that would honor and perpetuate the work of Living Traditions and of the KlezKamp community as well. The idea was met with great enthusiasm from colleagues across numerous disciplines on campus, including theater, music, art, dance, language and most importantly, the University library. The library has agreed to house the Mayrent collection and to make it universally accessible as well as to preserve and maintain the original discs in perpetuity. That was a pivotal commitment and in the last few months, we put together a larger proposal for an institute of Yiddish culture on the UW campus. That proposal worked its way through the various university committees and two weeks ago we were informed that it had passed unanimously. So, tonight, I am honored to announce the creation of the Mayrent Institute for Yiddish Culture to be permanently located on the campus of the University of Wisconsin-Madison. The initial funding for the institute is made possible by a generous gift from Sherry Mayrent and Carol Master. The Mayrent Institute for Yiddish Culture will be a unique facility devoted to fostering an understanding of the world of Yiddish through its arts. The institute will be directed by Henry Sapoznik. The work is not done yet though, and the university along with the Center for Jewish Studies has undertaken a campaign to raise the additional funds necessary to insure the longevity of the institute as well as to achieve all of the goals that we have set out for it. I want to say one more thing about this: Though I have not been associated with KlezKamp for very long in the scheme of things, what I realize is that KlezKamp is a community effort that has inspired tremendous loyalty and ownership in the future of a very fragile culture. The Mayrent Institute honors the contributions of countless people over the last 25 years and is a measure of the commitment and hard work by the staff of Living Traditions as well as the efforts of every teacher and participant of every KlezKamp. We are truly blessed by this. Henry Sapoznik, Cookie Segelstein, Pete Sokolow, Alex Kontorovich, Micheal Winograd, Mike Cohen, Frank London, Daniel Blacksburg, Jim Guttman, Aaron Alexander, Loren Brody, Malka Lerner, Adrienne Greenbaum. Henry Sapoznik, Cookie Segelstein, Pete Sokolow, Alex Kontorovich, Micheal Winograd, Mike Cohen, Frank London, Daniel Blaskburg, Jim Guttman, Aaron Alexander, Loren Brody, Malka Lerner, Adrienne Greenbaum. Henry Sapoznik, Cookie Segelstein, Pete Sokolow, Alex Kontorovich, Micheal Winograd, Mike Cohen, Frank London, Jim Guttman, Aaron Alexander, Loren Brody, Malka Lerner, Adrienne Greenbaum. 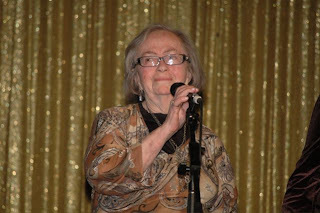 Pearl Sapoznik singing in the hall..
People have started to arrive, and in a couple of hours the trickle of arrivals will swell to a torrent. The registration folders are in pristine alphabetical order, waiting to be handed out; signs point the way to all the classrooms, the tees and sweatshirts are folded and sorted by size. Even the sun is shining. Man, it was cold, colder than I could ever remember with snow everywhere. Sure it got cold on the Oklahoma plains where I was born and raised, but I had been living in Texas for a long while now and tonight I stood shivering in my cowboy boots there in the foyer of the Paramount. Just as unfamiliar to my experience was the great bus-load of little old folks and precocious little kids streaming into the old resort, all a ruckus with big hugs and joyful reunions, chattering away in this strange Germanic tongue. Up to that point, the only Yiddish I had heard was my Godfather Morris Katz calling his milk cows into the barn for the night back in Stillwater. Frankly, I had never around this many Jews before, not even at High Holy Days. My head was swimming. “Oh good, you made it!” said the guy who invited me as he bounded towards me in the lobby. I had never met Henry Sapoznik in person but we had corresponded for years and for just as long he had been cajoling me to come up to “Kamp.” Though technically a stranger (heck I didn’t know a soul there really,) he hugged me like an old friend. “You’re just in time! The dancing is starting. 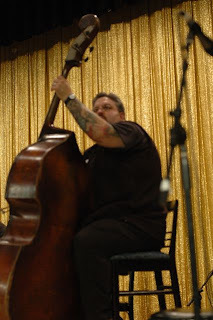 We need a bassist.” He led me down into the Tanzhall and bade me onstage. I took of my coat, inquired about a key from the amiable clarinetist, and proceeded to clam my way through a thrilling set of dance tunes with Merlin Shepherd and Loren Brody. Back home in Texas I play for dancing quite a bit, it’s one of the reasons I live there in fact. But here for the first time in my life I was actually playing Yiddish music, MY people’s music, for room full of Jewish dancers dancing Yiddish dances. Not a concert, with lifeless music set in amber, distant and removed. Tonight, here at this place music had sprouted legs, was drinking a bit too much and was tearing up the dancefloor. I don’t know if I can properly express how huge a thing that is, how music literally comes alive when it’s simply just a part of a greater function, in a living context. 13 trips back to the Catskills over Xmas week later, I am still in awe of that first of what was to be many, many “Klez Kamp Moments.” If only for this one gift, dayenu. Truth is I’ve got quite a lot of stories I could tell you; of the musical relationships that formed here, of the people I now call my family, how these experiences have in many ways made me who and what I am not only as a musician, but as a person and as a Jew. Of the deeply moving naches of watching the same little pischers who were running around wild when I first came here mature in the adults that we now look to continue our work. I could tell you about the time I was down with no one to turn to and how this community, the Yiddish Culture family that Klez Kamp gave birth to 25 years ago and nurtures to this day, lifted me up with love and support. I don’t know if I can properly express how huge a thing that is. The hotel is quiet tonight. Five of us are quietly working on our computers in the lobby; the bartendder has a football game on the tv, and the Epes Center is starting to take shape. Once again, KlezKamp is about to happen. In a few short hours, old friends and new will start trickling then pouring in, and by dinnertime the lobby will no doubt be full of music. It's just as exciting now as it was 22 years ago when I walked in for the first time. 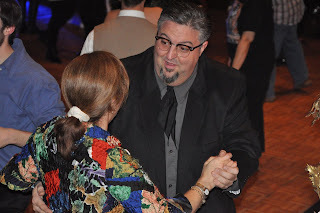 On the verge of celebrating our 25th annual winter KlezKamp, starting tomorrow at the Hudson Valley Resort and Spa in lovely Kerhonson, NY, we have brought our blog into the modern era by linking to our Facebook page. Please join us, either in person or in cyberspace, as we keep you up to date with our celebration of our first quarter century. And for a forshpayz (a taste) of what's to come, check out last year's blog entries for some fine music and photography, as well as on the spot impressions of the program. "Set the Way-Bac Machine for 1989, Sherman...."
This transmission comes to us from that far off universe called 1989, when, after only a few short, successful years of running KlezKamp at the late and very lamented Paramount Hotel, we launched the first of two summer KlezKamp West events in northern California. This one was at Camp Swig in Saratoga, California. The next was in 1998 in Petaluma. The wonderful thing about this surprisingly sweet little piece is that it very accurately captures a crystalline moment when we were collectively creating and honing our shared common Yiddish culture as we were inventing the context of KlezKamp. The enthusiasm and vitality displayed here -- fresh as all things back then always seemed to be -- is what made creating, learning and playing together the great experience it was. Oh, yeah: and we were nerdy, too! Among those you'll see here are: Adrienne Cooper,her mom Buni Cooper, Joel Rubin, Gerry Tenney, Alan Bern, Margot Leverett, Wendy Marcus and her daughter Sophie Shifra (in the very touching scene where Wendy signs for her) Michael Alpert, Harvey Varga, Sarah Felder, Alan Senauke, Dan Peck (shlepping boxes in the background of one interview) and some young skinny kid who looks like Groucho Marx in a Brooklyn Dodgers cap. Thanks to KlezKamp KlezKids Co-Director Sarah Gordon (who is also in it) for unearthing this video cuneiform and reminding us that, though we've changed on the outside, we're still as youthfully passionate and devoted to Yiddish music and culture as ever. HooHA! Thanks to our friends Mark Rubin, Mitchel Mernick and many others, you may now subscribe to the KLEZKAMP PODCAST. We intend to add new episodes to the podcast offerings on a regular basis. They will reflect not only this past KlezKamp 23, but gems from our sound archive of 23 years of KlezKamp concerts and, more recently, Radio KlezKamp, the in-house radio station run at KK by Mitch Mernick. We are thrilled to be able to share these treasures with you. It is just one of the ways that Living Traditions is fulfilling its mission to bring Yiddish culture to new generations in ways both inspiring and relevant to contemporary Jewish life. Fortunately, there is much more to come. 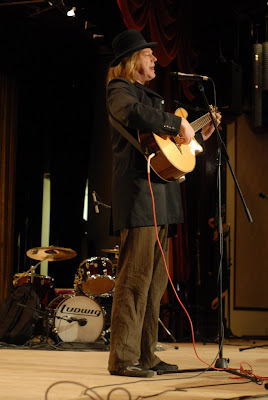 Here is another set of KlezKamp photos, these by Alan Lankin. Here are more KlezKamp 2007 photos, these courtesy of Bonnie Greenberg. 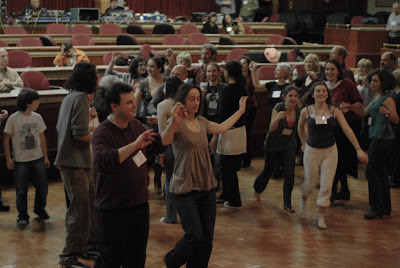 If you have an album of KlezKamp 2007 photos you would like to share, please send the link to info@livingtraditions.org and we will post them here and on the KK website. Yet again, the week for we spend months and months planning, is gone for another year. KlezKamp23 is over, and with it, the memories we created for the over 425 people who joined us -- 70% of them first timers -- are now in place. It seems like only hours ago that we made our quiet arrival on Saturday the 22nd in advance of an uncharacteristically thick London-like fog which enveloped scenic Kerhonkson. Our tiny crew which set up KK (Dan Peck, Sherry Mayrent, Sabina Brukner. Carol Master, Laura Wernick and Amber Feldman, among others) were soon joined by the eager masses of people from around the world who came to share the lush bounty of Yiddish culture with us. It was non-stop from then on. Despite that, we are excitedly planning KK24. See you then! Jake Shulman-Ment is among the premier young performers of klezmer violin. 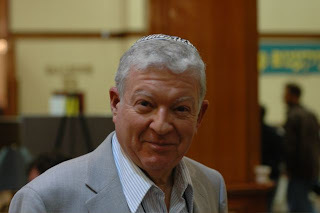 He has performed and recorded with many of the stars of the international klezmer scene, as well as with his own groups. Proficient in a variety of styles, Jake has travelled extensively in Hungary, Romania, and Greece documenting, recording, and performing traditional folk, Gypsy, and Jewish music. 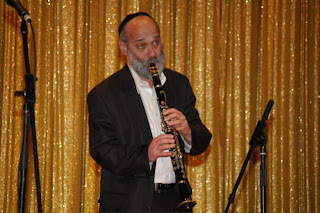 A short excerpt of the epic Philadelphia Sher, which ran close to 20 minutes of continuous playing and dancing, the later ably lead by Steven Weintraub. 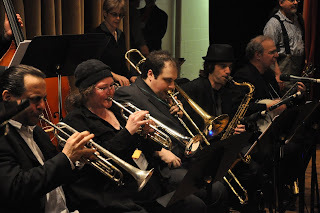 Elaine Hoffman Watts on traps, Mike Cohen, clarinet, Ken Maltz, alto sax, Adrian Banner, piano, Susan Watts, trumpet, Dan Blacksburg, trombone, Henry Sapoznik, tenor banjo, Mark Rubin, tuba and conductor-arranger Aaron Alexander. Here violin instructor Cookie ("Marlene") Segelstein and tsimbl-accordionist Joshua ("P.J. ")Horowitz of Veretski Pass play a snippet of a tune from their newest CD "Traffik," released just this week. Staffers Mark Rubin and Andy Statman play a little American music at the staff concert. Introducing the Klez Kamp Podcast!! Tonight's evening program was an opportunity to introduce this year's KlezKampers to the Living Traditions CD series documenting some of the treasured elders of our community. These recordings are each made during the four days of a KlezKamp and feature stellar ensembles of our staff musicians. The first one, recorded atKlezKamp 21 and released last year, documented the playing and repertoire of the late German Goldenstein, who died unexpectedly shortly after it was completed. 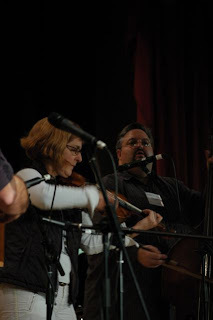 Fortunately, the subjects of both last year's effort, Ray Musiker, and Elaine Hoffman Watts (who is being recorded this year) were on hand to received some well-deserved koved from the crowd in the Manhattan Theater. The evening began with the ensemble that recorded the Ray Musiker CD: Ray (of course), Ken Maltz, Mike Cohen, Aaron Alexander, Jim Guttmann, Henry Sapoznik and Pete Sokolow, who was the musical director for the project and provided informative introductions to each tune. They performed six selections, and I found the arrangements totally delightful. The playing was wonderful, as were the tunes, many of which had been written by Ray himself. This half of the show closed with the beautiful arrangement of Papirosn by Sam Musiker that I had last heard played on the KlezKamp stage by Ray, Howie Leess and Paul Pincus. After a brief talk by Henry on the need for community support of this important series, the ensemble that is in the process of recording Elaine and her family's unique musical heritage came on stage. I have always loved both Elaine and her drumming, and she was in excellent form tonight. I was especially moved when she pointed out it was kind of amazing that KlezKamp had on staff this year not one, but two winners of the prestigious National Heritage Award from the National Endowment for the Arts, and that both were women. 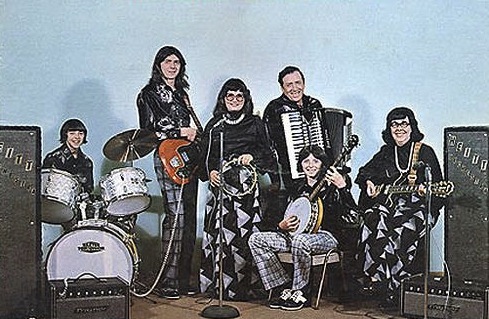 This band consisted of Elaine, her daughter Susan Watts, Mike Cohen, Ken Maltz, Dan Blacksberg, Adrian Banner and Mark Rubin, and they performed some amazing tunes from the Hoffman family archives, including a freylekhs that Elaine's father had written for her. The concert closed with a beautiful waltz that made me cry, and I remembered that it had also made me cry the first time I heard it, back at the Paramount in a class in which Hankus Netsky was interviewing Elaine and a fellow Philadelphia musician, Joseph Buloff. It was a moving end to a very moving evening. It occurred to me while I listened how incredible and unique this project is: When the current CD is completed, we will have three recordings representing three completely different klezmer styles and repertoires, each equally authentic and each equally beautiful and engaging. As Henry said this evening, we may not have the money we need to support all the projects we want to accomplish, but we beyond wealthy in human resources. I feel really lucky to be a part of this organization and to play a role in making these projects happen. Last night's Staff Concert was full of noteworthy performances each of which would be the highlight of any other klezmer concert. One of the highlights of those highlights for me was nonagenarian KK dance teacher Felix Fibich's improvisational dance accompanied by accordionist Evan Harlan, our terrific new accordion teacher. Others were a rocking duet by Mark Rubin on bass fiddle and Andy Statman on mandolin, Michael Winograd's clarinet turn, Paula Teitelbaum and Susan Leviton's solo songs, Michael Wex's hilarious comments as emcee and so many others. 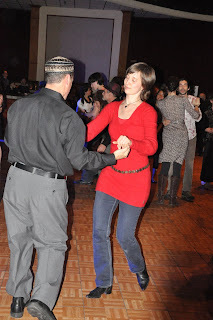 The evening concluded with dancing to staff and student bands as well as another night of KlezKamp cabaret, this time featuring Yiddish Art Song. 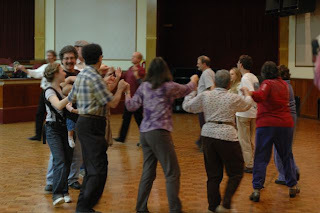 Hard to believe that KlezKamp is more than half over (it's Wednesday after lunch as I write). Radio KlezKamp is broadcasting, small groups of students are practicing in the lobby, others are browsing Sal Kluger's impressive retail array, and still others are juggling. Ah yes, this is the sensory potpourri that is KlezKamp at its finest. I had just finished with the Slow Jam in the lobby just before dinner yesterday, when I heard Carol (my other half) calling to me excitedly. "Can you play Pua Mana for us so we can dance?" she asked. She had found a fellow ukulele player and they had discovered that they both know the hula to this beloved Hawaiian song (in my non-KK life, we are part-time residents of the aloha state and in fact will be returning there next week). So, for the first time at KlezKamp, traditional hula was performed. Not Yiddish, but very KlezKamp. We had one of those "only at KlezKamp" moments last night. It epitomized our goal to have older masters of the Yiddish folk arts transmit authenic Yiddish culture directly to the next generations. We screened the new film documentary about Yiddish poet and songwriter Beyle Schaechter-Gottesman, a member of our KK faculty this year. The film consists entirely of Beyle speaking in Yiddish, telling her life story and reciting and singing the poetry that has come from her experiences, illustrated with her paintings and photos. The audience, most of whom are not Yiddish speakers, sat rapt by Beyle, even through the filter of subtitles. After the film, Beyle answered questions posed by KKers. KKers heard the story of a person whose life and whose art is conducted entirely in Yiddish. They heard directly about Yiddish life in Eastern Europe before the war and the impact of the war on a single individual. They heard a story of coming to American and making a life and making art here. Here, at KlezKamp, they have the opportunity to sit and talk with elders who are eager to share their experiences. It is an increasingly rare opportunity, tsum badoyern. It's a privilege to help make it happen. Er, what day is it again?? I mean, there's yiddish music in every corner and yiddish language at every table. There's no dead tree propped up in every corner, and no snow men anywhere. Like Andy Statman said last night, the sound of no jingle bells anywhere is the sound of home. My first impressions this year is the vast number of first timers here, and of the high level of cultural literacy that they bring with them. It's a gas to see folks line up the dots and find the context to the music, art and dance that they have devoted themselves to. Even a jaded staffer like myself has to step back and marvel at these moments. It's heartening to know that these folks will take this contextual depth with them, and hopefully inform the communities that they come from, with any luck raising the bar that we here will have to rise to. But enough palaver, back to the dance band stage! !